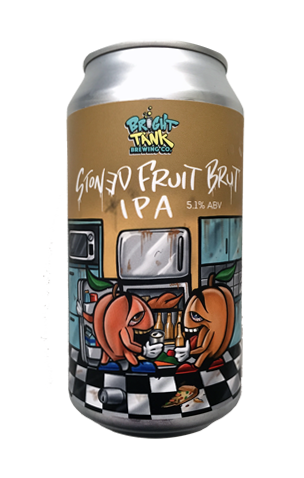 While Stoned Brut IPA’s equivoque plays out on the can art, the “let’s put everything that’s happening in brewing right now into one beer” sensibility resides within. This zeitgeist-pilfering limited release plays with kettle souring, fruit puree adjuncts, New World dry-hopping and 2018’s ascendant IPA style. Heck, this only needs a vial of kveik, another of London Fog III and some lactose to summarise modern brewing at the tail end of the twenty-teens. Apparently, this is what we asked for. Were we all stoned?! In this case, maybe not. The collision of concepts has resulted in beer that, if the drinker were none the style-guide wiser, could be considered refreshingly tropical. Mango, peach and pineapple fruit tingle-like aromas are the first giveaways. The vibrant lemon yellow colour with hop oil haze another. On the palate, the mango and peach puree gets a fruity lift from El Dorado and Galaxy hops, while the dry palate is stippled by a tight carbonation and slight sour edge.